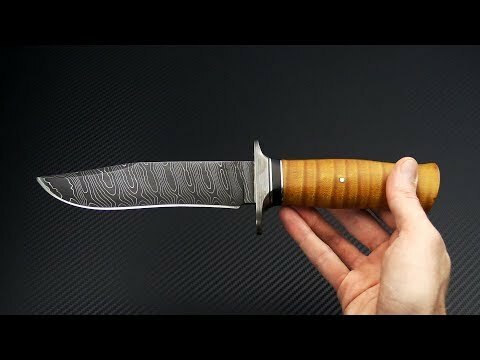 The Burr Oak Custom Fighter is a serious "bowie-style" full custom fixed blade knife handmade by Mark Nevling. The Fighter is a visual masterpiece but it sacrifices nothing in terms of functionality. This piece is made from a Bold Twist pattern carbon steel Damascus blade with a Dyed and Stabilized Maple handle, Ebony and nickel silver spacers and a wrought iron guard. Blade: The Fighter comes with a long, beefy recurve blade that is convex ground for toughness and cutting performance with a clip point for piercing. The blade has belly enough for skinning tasks with a recurve edge for aggressive slicing. The carbon Damascus is tough and takes a razor sharp edge for easy maintenance in the field. Handle: The handle is made from an elegantly contoured piece of Dyed and Stabilized Maple that offers a solid grip for even the largest hands. It is attached with a single, elegant pin to the hidden tang and fit flush to the nickel silver spacer that is followed by a wood spacer and a large, wrought iron double guard that keeps your fingers safe from the blade during use. The flared pommel end pair with the dual guard offers optimal control and security. Sheath: Carries via hand stitched leather belt sheath with dyed Bison leather inlay.